The water-saving nozzle「Bubble90」is a new type of tap nozzle that saves water effectively and increases water-saving rates by up to 95%. Installation is simple. 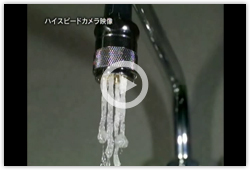 The nozzle is designed so that you just need to attach「Bubble90」directly to the tap. Despite having only one-tenth the amount of conventional water usage, 「Bubble90」creates a higher-quality cleansing stream than a conventional tap could. 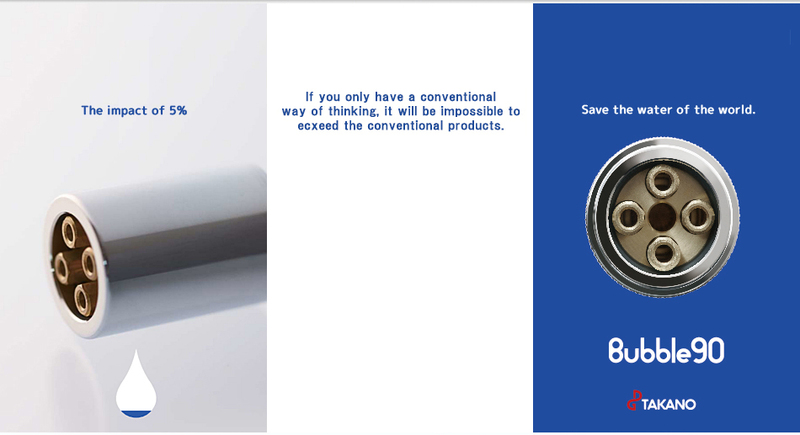 You can adjust the water pressure or volume to your preference by simply turning the ring. 「Bubble90」has a "clog prevention system" built-in. By pulling the aerator down, it enables dirt inside the tap to drain off using only water pressure. 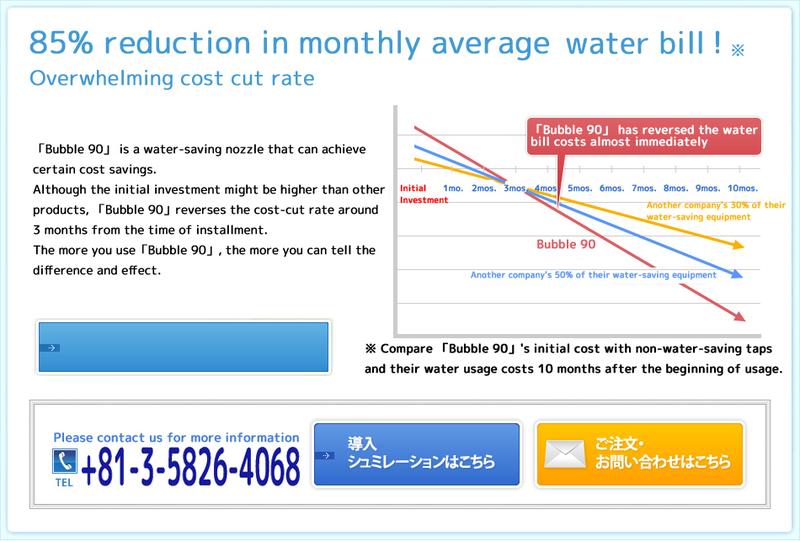 You can use「Bubble90」comfortably with free maintenance at any region of water pressure・water quality. 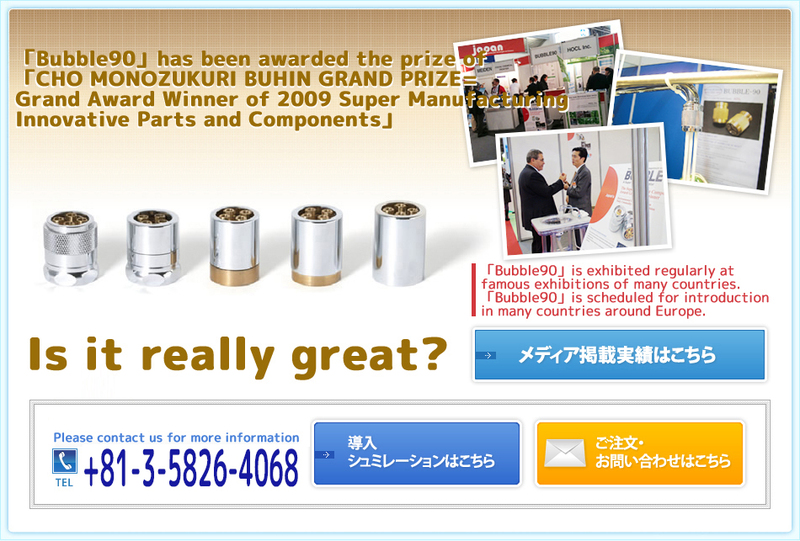 We are sure that you can feel the effect of 「Bubble90」by touching the water while cleaning. Also, you can see the difference clearly in your monthly water bill. 「Bubble90」is recommended for those who don't see sufficient results when using other water-saving appliances or water-saving nozzles. At DG SALES, we aim to introduce「Bubble90」, a product which has achieved two opposing things: "Cleansing Power" and "Water Conservation" at the same time, not only to Japan, but to the world as well.